We know our fair bit about coffee and with numerous qualified baristas amongst our ranks; we know how to make a mean drink too. Whatever your coffee of choice, be it a neat espresso, a sweet and frothy cappuccino or the trendy flat white, we can help you make it. Brew your espresso into a small cup. The normal extraction time should be roughly 25 seconds and the volume should be about 1oz. There should be a nice crema on the surface which will support sugar granules before they gradually sink to the bottom of the cup. Extraction should be still at the 25-second mark, but grind the beans finer to reduce the flow of water. 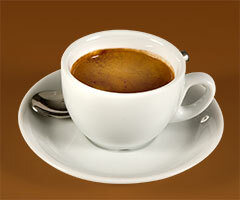 This is quite simple to produce: Make your espresso as normal and then simply top it up with hot water. Much like a latte, the key to the perfect cappuccino is in the milk. 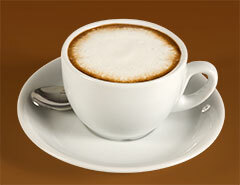 However, here we are focussing on creating plenty of foam, the signature of this traditional Italian coffee. Start by heating your milk with the steam arm, but keep the wand just below surface level. Keep an eye on the milk’s temperature and when it starts reaching 60°C move the jug up arm for a moment or two, and then stop. Now it is time to add the foam and milk to the espresso. Start by giving the jug a quick swirl and then, using the side, pour low over the cup. As the foam begins to settle, pour from a higher position to add the heated milk. Finish off with a sprinkling of chocolate powder and voila, an expertly made cappuccino. Espresso + steamed milk + (a little bit of) frothed milk. Served in a tall latte glass. Making up around two-thirds of the drink, the key component of the latte is the milk which needs to be evenly heated and without an excess of foam. This is achieved by introducing less air into the milk during the heating process by placing the steam arm a little bit deeper, to avoid too much air being dragged into the liquid. Add the milk to the espresso and fill the glass. If poured correctly, there will be little amount of naturally formed foam on the top of your drink. The flat white has become very popular in recent years and despite its seemingly simple composition, it requires a delicate touch to perfect. Once mastered, the results will be unbelievable! The milk, when heated, should be stretched and not foamed. Keep the tip of the steam wand slightly lower in the milk than normal, as your aim here is not to introduce a lot of air into the liquid. The temperature should not exceed 60°C, and if done properly, the quantity of the milk should not double. Just before adding the milk to the double espresso, bang the bottom of your pitcher to break any air bubbles, swirl once and then gently pour so that the large crema rises to the top. In many respects, a true latte macchiato is like a jumbled up latte. The drink derives its name from the Italian for “stained milk” and in that, we get an impression of why it is different to its commonly consumed sibling. 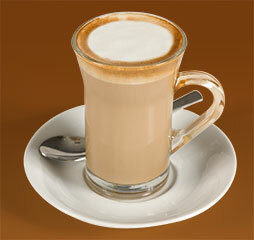 Heat some milk in the normal manner for a latte and then pour into a latte glass, until it is about two-thirds full. There should be a nice concentration of heated milk at the bottom with a layer of fluffy milk foam resting on top. 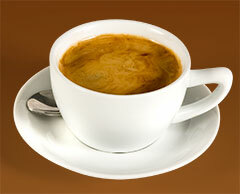 Make your espresso now, which affords the milk time to settle. Transfer your espresso into a small espresso pitcher and then pour down the side of the latte glass, puncturing the milk foam, staining it. The result should be a visually layered drink with the milk at the bottom, the espresso in the middle and the foam on top.